To coincide with the exploration of sub-glacial Lake Ellsworth in Antarctica this winter, Millennium Court Arts Centre presents Crystalline, an exhibition of work by both internationally known artists and local practising artists, graduates & postgraduates living or working throughout Northern Ireland. The exhibition incorporates pieces submitted through Open Submission and by invitation. The work explores the twin themes of scientific endeavour and the landscape of Antarctica. Working in various disciplines the artists represented in Crystalline cover many facets of Antarctic exploration, teasing out aspects of the barren terrain of the surface (seemingly devoid of colour, sound and life) and the inverted landscape of the sub-glacial underworld. Works by Dorothy Cross represent art made on location in extreme conditions. 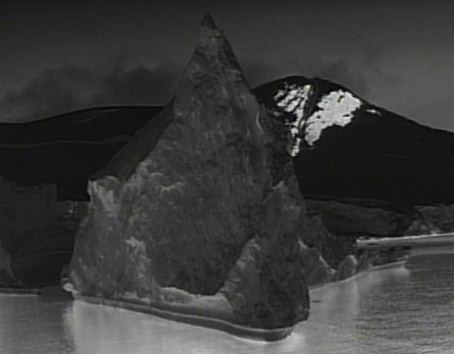 Cross’s Antarctica (2005) is a monochromatic film rendered in negative showing a group of deep sea divers in the icy, crystal waters of Antarctica.